When Bijan Rademacher was told he was going to be on the taxi squad in the Arizona Fall League, meaning he would only play two days a week, he wasn't upset. He said, "Thank you for the opportunity," and welcomed the challenge. So far, the reception has been warm. 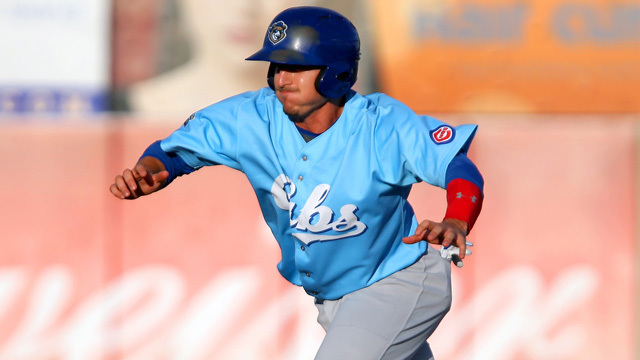 In his third AFL game, the Cubs outfield prospect went 2-for-4 with an RBI and stole home on Saturday night as Mesa defeated Salt River, 8-4, for its fourth straight win. "I'm accepting the challenge because I've always been the underdog, and I'm OK with that; I want to prove people wrong," Rademacher said. "I want to show that even playing two days a week, I can do more than the guys playing four days a week." The 23-year-old outfielder singled in a run in the second inning and reached on a bunt single in the fourth. He moved up on a throwing error by catcher Jason Adam (Twins), then took third on a single by Blue Jays prospect Dwight Smith Jr. Rademacher got the green light to head home on a double-steal and, with the Solar Sox holding a four-run lead, he thought it was a risk worth taking. "That's one of the biggest things I came to Fall League, to prove that I can be a basestealer," he said. "I had bad technique, [but] I'm fast enough to do it and I'm quick enough to do it." Every day since arriving in Arizona, Rademacher has been working with Cubs baserunning coach Mike Roberts -- the father of recently retired second baseman Brian Roberts -- on improving his jumps and his sliding. That's after he was successful on only four of 12 tries this season in the Florida State League. While he only has Wednesdays and Saturdays to get in a rhythm at the plate, Rademacher has a .455/.455/.455 slash line with three runs scored in three games. Aside from Radermacher's RBI single, the Solar Sox got all of their production from the bottom of the lineup. Nationals No. 17 prospect Tony Renda smacked a two-run triple, while Pedro Severino -- Washington's 11th-ranked prospect -- and Angels Nos. 4 and 15 prospects Kaleb Cowart and Eric Stamets each added an RBI. Nats No. 16 prospect Felipe Rivero (1-2) left in the third with an apparent injury. The Mesa starter allowed three runs -- two earned -- on three hits and three walks while striking out two over 2 2/3 frames. For Salt River, Archie Bradley (0-2) ran into trouble of a different kind. The D-backs top prospect surrendered seven runs -- four earned -- on three hits and four walks while striking out two in two frames. "I felt good," MLB.com's No. 9 overall prospect said, "just didn't throw strikes. That's really about it. I feel like my stuff is sharp. It's just about filling up the zone and making better pitches." Rockies No. 11 prospect Trevor Story and Peter O'Brien -- Arizona's seventh-ranked prospect -- drove in runs for the Rafters, while Chris O'Dowd (Rockies) smacked his first AFL homer. Kelsie Heneghan is a contributor to MiLB.com. Follow her on Twitter @Kelsie_ Heneghan. This story was not subject to the approval of the National Association of Professional Baseball Leagues or its clubs.